April 28, NFG workshop-- American Bulrush Pouch Class with Peggy Wilcox. Twine a beautiful pouch using bulrush and maidenhair fern. October 26, 27 & 28, 2006 Open Pine Needle Basket Workshop ! 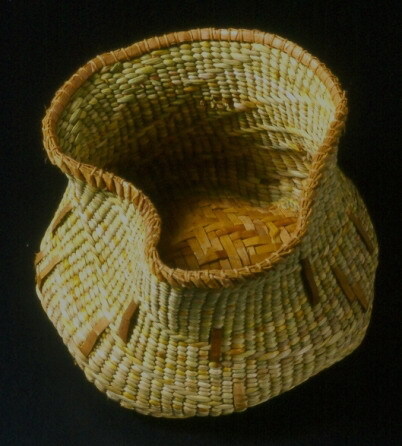 We are planning a trip to the Rocky Mount Art Center to see two basketry exhibits: Billie Ruth Sudduth's work and work by the Tar River Basketmakers Guild. The trip will take place on Saturday, August 26th, 9:00am at the Food Lion on 264 in Washington, on the shopping center across from the Hampton Inn (intersection 264 & 15th St.) After we're finished at the Art Center, we'll go out to lunch in Rocky Mount and then head back. The regular August 17th meeting will be canceled, as this trip will be our other activity for the month. Aug 5, 2006, Special Tulip Poplar Gathering with Sam Taylor- Members who have registered will meet on Saturday, August 5th, 9:00am at Lowes parking lot, Washington, NC. We'll go to Sam Taylor's nearby property- the woods, and learn to gather bark from the tulip poplar. Wear protective clothing. Bring: leather work gloves, insect repellent, sunscreen, toilet paper, pocket knife or utility knife, heavy duty scissors, rubber bands or twine, folding chair or stool, tarp or plastic for ground sitting, a bag lunch and water. Sam does chair caning and makes rustic furniture from materials he gathers. Next Meeting- Monday, Aug. 7 at 6:00pm at The Blind Center in Washington. We will be making plaited necklace pouches. Those who have collected tulip poplar bark (the previous Saturday) can prepare some and bring it to the meeting to use. You will be told how to prepare it for use at the bark gathering. Those who don't have bark or would just like to practice making the pouch before using their bark another time can bring flat cardboard. Cereal boxes, mac & cheese, or similar food boxes work well, as do tissue boxes with attractive designs. One box should be enough. April 28, The Natural Fibers Group did programs consisting of talks with hands-on projects at Eastern Elementary, Washington, NC. Several hundred children were introduced to basketry and gourd work. April 22nd, Palmetto and Yucca Gathering Expedition. We had a ball gathering and processing these materials for later projects! Dean Lee, second place in Novice Coiled! Dory Maier, who tied with herself for third place in Advanced Coiled! Lynn Hoyt, first place in Advanced Coiled! Registration for this two day class is open now! Great workshop-- so much fun!! December, 2005- Sweetgrass Workshop Filled ! 10-3-05-- NFG display booth wins first place (Civic and Community Groups) at the Pitt County Fair, Greenville , NC! This is our second year participating and our second first place win! Special thanks goes to the set-up crew: Stephen Jones, Gloria Jones, Cassandra Jones, Pamela Zimmerman , and Lynn Hoyt . This year's theme is "Bountiful Baskets." Everyone is encouraged to attend this fun event, enter the competition, and take classes. 3/05 NFG Members Sweep NCBA Exhibit Room- Coiling Division, Other Awards Also Won! 10/30/04- The Kudzu Workshop is over and it was fun! Look for another natural basketry workshop from the NFG in early 2006!